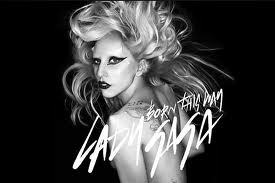 After months of hyping and teasing, Lady Gaga has finally released her anticipated new single, "Born This Way." "It doesn't matter if you love him or capital H-I-M," she says at the song's dramatic opening, "because you were born this way, baby." The track -- written by Gaga and produced by DJ White Shadow, and Fernando Garibay -- is an immediate dancefloor anthem that marries big beats with Gaga's powerful, distinctive vocals and in-your-face lyrics about race and sexuality. Last month, Gaga personally leaked the song's lyrics and credits on Twitter as a thank-you to her fans. DJ White Shadow told Billboard.com last Wednesday (Feb. 2) that the song was recorded "around the world" and that it "sounds like it reads, but not like you think until you hear it." Gaga will perform the song on Sunday at the Grammys, where she is nominated for six awards, including Album of the Year and Best Female Pop Vocal Performance. Gaga's new album, also titled 'Born This Way,' drops on May 23.